Emmi Hall, a graphic designer with a strong interest in education and artistic expression, is the new Mesa County Libraries 970West Studio Artist in Residence. During her residency – which lasts from Jan. 9 through April 24, 2017 – Hall will present a variety of workshops and activities for all ages. Hall recently graduated from Colorado Mesa University with a bachelor of fine arts degree in graphic design. Her passions include education and art, with the belief that artistic expression is a necessity of living. Her passion for art flows from her desire to share knowledge; she believes that you must learn all you can to share all you can. Hall is a freelance graphic designer, and her work ranges from illustrating children’s books to advertising project management. Studio Hours. Hall will host regular open studio hours in the 970West Studio, Fifth Street and Ouray Avenue (across from the Central Library), from 9 a.m. to noon every Monday (except for holiday closures on Jan. 16 and Feb. 20). Fueling the Creative Process. 6:30 p.m. Wednesday, Jan. 11, in the Central Library Community Room, 443 N. 6th St. Seating is limited, and registration is required either by calling 970-243-4442 or visiting the online Events Calendar. Do you have a goal to be more creative in 2017? The creative process can be difficult, and sometimes stepping away from a project is the best solution. Different methods of brainstorming, word association, mind-mapping, and other methods of promoting creativity will be presented. Hands-on and visual examples will let attendees solve prompts in their own personal way that will carry over into their everyday life and personal artistic process. Supplies are included. Meet and Greet. 4-5:30 p.m. Friday, Jan. 20, in the Central Library Community Room. 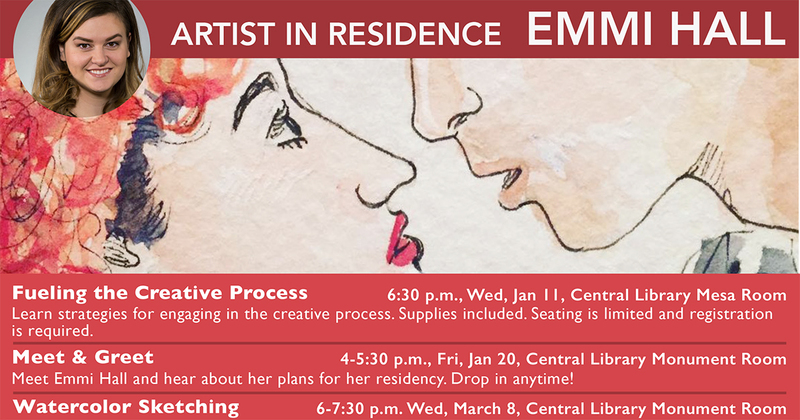 Join us for an open house to meet Emmi Hall and hear about plans for her residency. Groundhog Day Party. 3:30 p.m. Thursday, Feb. 2, in the Central Library Teen Area (teens only, please). Join us in the Teen Area for a party you’ll want to repeat over and over again. Create cartoons out of Punxsutawney Phil’s shadow while watching the movie “Groundhog Day.” Snacks will be provided. Un-Valentine’s Party. 3:30 p.m. Thursday, Feb. 9, in the Central Library Teen Area (teens only, please). Valentine’s Day can be gory. As we watch “Warm Bodies,” learn how to apply horror movie special-effects makeup. Use our camera to document your fresh wounds. Finger Paint Monsters. 2-4 p.m. Wednesday, Feb. 15, at the Central Library (this Kids’ Club event is for children only, please). Learn to finger-paint monsters! Use watercolors to create creatures of your own imagination while we read stories about scary and silly monsters. Watercolor Sketching. 6 p.m. Wednesday, March 8, in the Central Library Community Room. Seating is limited, and registration is required either by calling 970-243-4442 or visiting the online Events Calendar. Nontraditional resources will be used in this hands-on workshop. Participants will create their own watercolor kits using everyday household ingredients. Observational watercolor sketching will focus on creating artwork from limited ingredients and surroundings. Supplies are included. Cartoon Fingerprints. 6:30 p.m. Thursday, March 23, at the Central Library (this Neighbors Read event is for children and their families). Learn to create cartoon characters from your own fingerprints! Finger-paint with watercolors and learn how to give feelings to your creations. First Friday Showcase. 4-5:30 p.m. Friday, April 7, at the 970West Studio. Join us for an open house to see what Hall has accomplished during her residency. The event is open on a drop-in basis, and a short presentation will begin at 4:45 p.m.
From Sketch to Digital Art: A How-To. 9:30-11 a.m. Saturday, April 22, at the 970West Studio. Seating is limited, and registration is required either by calling 970-243-4442 or visiting the online Events Calendar. The process of getting a sketch to a final digital interpretation can be a frustrating process. Learn the steps of getting your idea from paper to screen in this hands-on class. Participants will need to bring a small piece of original artwork to be digitized using Adobe Illustrator. Posted in 970West, Crafts and Hobbies, General, Library News, Programs/Classes, Teens. What a GREAT lineup of events! I look forward to meeting the artist.